is seriously considering a run for Illinois Attorney General in 2014, he confirmed Wednesday. The Libertyville Republican has been meeting with citizens around the state and says he intends to run in the GOP primary in about 15 months. The big unanswered question burning in everybody's mind is howcome the lamestream media is reporting this just now -- when your LakeCountyEye broke the story, back in the day, like around Thanksgiving 2012? News may travel slowly out of Lake County. 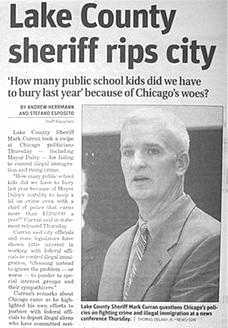 But how slow should it travel when the Lake County news has to go no farther than Lake County? Curran says his faith influences his position on various issues. "I spend time daily in prayer and in Mass and seek spiritual counsel, and I feel that I'm prompted with clarity that I need to embrace." So to reconstruct a timeline, Curran never had any intention to run for Attorney General -- that is, until sometime this week. Earlier this week someone must have called his attention to the rumors being spread by this blog. Whereupon Curran became convinced that he was missing a golden opportunity if he did not pull up political stakes and announce a run for Attorney General in 2014. For the record, it is also no secret that God is an RSS subscriber to this blog.